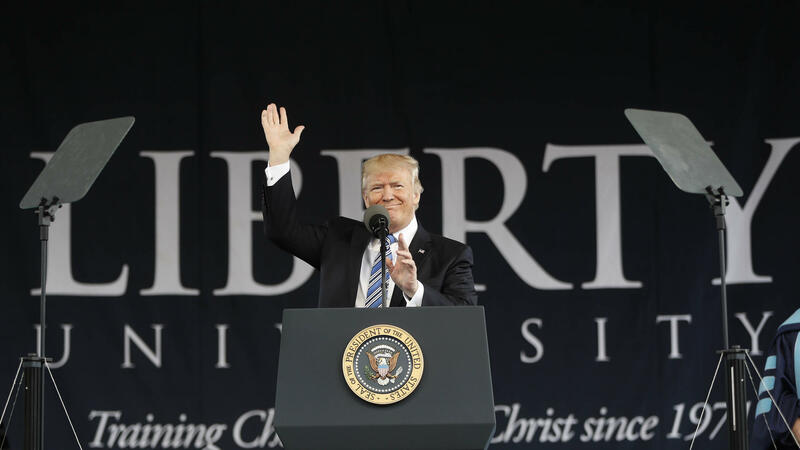 President Donald Trump gives the commencement address for the Class of 2017 at Liberty University in Lynchburg, Va., Saturday. 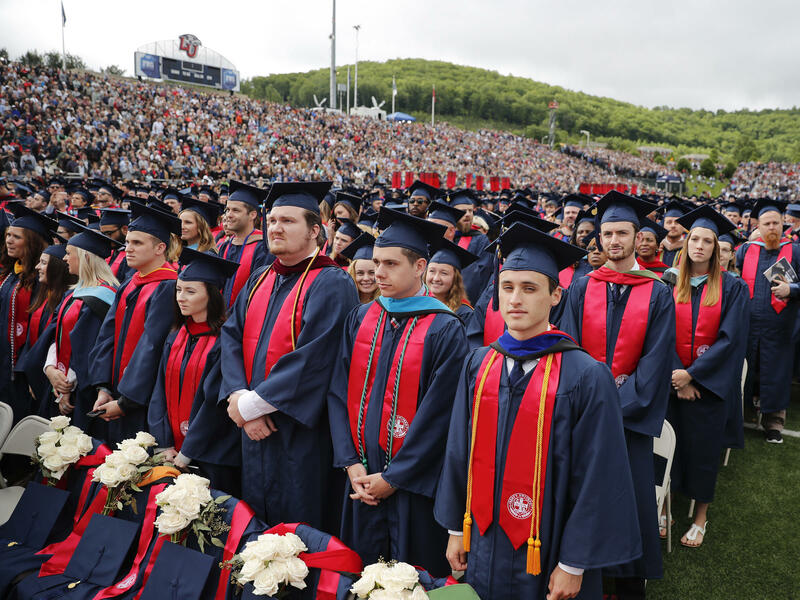 Members of the Class of 2017 stand as they wait for the arrival of President Donald Trump to give the commencement address at Liberty University in Lynchburg, Va., on Saturday. 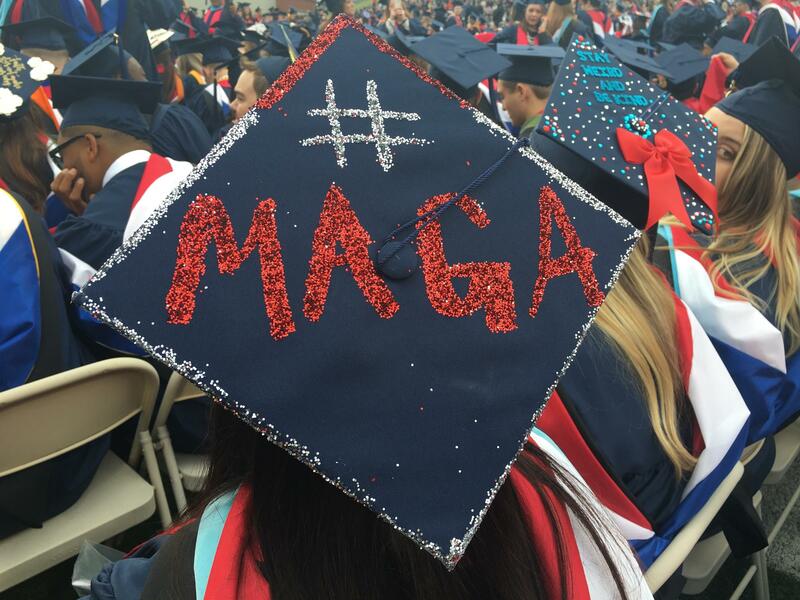 One of President Trump's trademark Twitter hashtags is seen at Liberty University's commencement ceremony Saturday in Lynchburg, Va.
For his first commencement speech as president, Donald Trump went back to a place that was once key to his efforts as a candidate to shore up support among the Republican base. Standing before tens of thousands of members of the Class of 2017 and their families at Liberty University's open-air stadium in Lynchburg, Va., Trump thanked the crowd for helping him achieve the presidency. "I wanna thank you because, boy, did you come out and vote — those of you that are old enough; in other words, your parents," Trump said. "Boy, oh boy, you voted. You voted!" A strong majority of evangelicals voted for Trump in November despite some predictions to the contrary. Liberty University President Jerry Falwell, Jr., was one of the first leading white evangelical figures to endorse Trump during the Republican primary season, though that decision wasn't universally supported at his university. In his speech, Trump jokingly nodded to the difficult odds he'd once faced. "Right here, the Class of 2017, dressed in cap and gown, graduating to a totally brilliant future; and here I am, standing before you as president of the United States. So I'm guessing there are some people here today who thought that either one of those things — either one — would really require major help from God," Trump said, drawing laughter and applause from the crowd. Trump bypassed more traditional options for a first presidential commencement speech, like the University of Notre Dame, instead sending Vice President Mike Pence. As graduation speeches go, Trump struck familiar themes: he urged students to be persistent, follow their passions and chart their own paths in life. He occasionally sounded self-reflective as he imparted wisdom to the graduates. "I've seen so many people, they're forced through lots of reasons — sometimes including family — to go down a path that they don't want to go down, to go down a path that leads then to something that they don't love, that they don't enjoy," Trump said. "You have to do what you love, or you most likely won't be very successful at it." Trump also seemed to allude several times to the 2016 campaign — advising students to claim the label of "outsider" and not be discouraged by naysayers. "The more that a broken system tells you that you're wrong, the more certain you should be that you must keep pushing ahead, you must keep pushing forward," Trump said. "And always have the courage to be yourself." The president's speech included plenty of language tailored to the conservative Christian audience. He alluded to his recent executive order billed as protecting religious freedom, though some critics said the language actually changes very little. Trump's visit to this bastion of support came after a tumultuous week in which he fired FBI Director James Comey and faced questions about whether the timing of the firing could be related to an ongoing investigation into possible ties between his campaign and Russian officials — after a determination by the U.S. intelligence community that Russia had meddled in the election to help Trump and hurt Hillary Clinton. He steered clear of that subject, making only sidelong swipes at his critics. "No one has ever achieved anything significant without a chorus of critics standing on the sidelines explaining why it can't be done," Trump said. "Nothing is easier or more pathetic than being a critic, because they're people that can't get the job done." He found few critics at Liberty University. Falwell, Jr., praised Trump's first few months in office, pointing to Trump's selection of U.S. Supreme Court Justice Neil Gorsuch, his decision to stack his Cabinet with religious conservatives and what Falwell described as bombing "those in the Middle East who are persecuting and killing Christians." Falwell said he's pleased with Trump's performance so far. "I do not believe that any president in our lifetimes has done so much that has benefited the Christian community in such a short time span than Donald Trump," he said. Several Liberty graduates and their families said they felt much the same. Lanora Hale came from Millville, N.J., to watch her son graduate with a master's degree. Hale said she's solidly behind Trump. "I really think he's doing great. He's trying — if people give him a chance, you know. People gotta give him a chance," Hale said. Hale said she wants to see a tighter connection between religion and government — perhaps prayer in public schools — and she sees Trump as friendly toward that goal. "I really am glad that he's putting God back into everything," she said. Newly-minted elementary education graduate Rachel Kreisel of Boca Raton, Fla., agrees. "[I want] to bring Christ back into our nation and into our schools, since we don't have him in schools rights now; it's just silent prayers," she said, "I would love to see the prayers back into schools because it makes a big difference." For Josh Kirkland of Pensacola, Fla., graduating with a bachelor's degree in cinema, it was an "honor" to have the president speak at commencement. But he said it's "early to say" what to make of Trump's unconventional presidency. "He's certainly been busy," Kirkland said, "both in the office and on Twitter."